I’d rather have one which has a unit that lights up as it does in the film, but this is still pretty cool. * Get to the heart of the matter with Iron Man! * High-quality t-shirt featuring Tony Stark’s power center. * Wear your favorite movies! Iron Man 2 Heart Core T-Shirt. 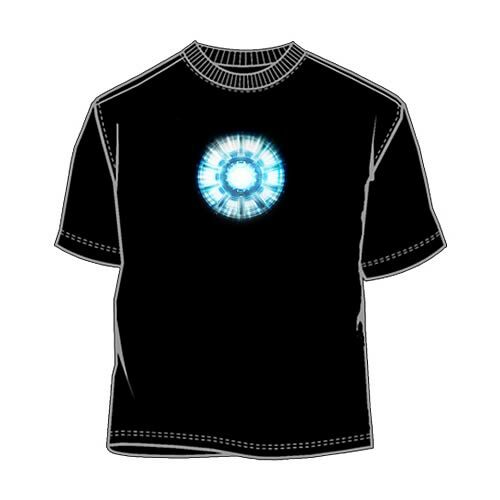 Show your own proof that Tony Stark has a heart with this 100% cotton, high-quality black t-shirt. Machine washable. Order yours today! If you have seen Iron Man 2 (opening today in the States) you will know that Tony Stark’s (Robert Downey Jr) father is in it. He shows up briefly on some old films that Tony watches. 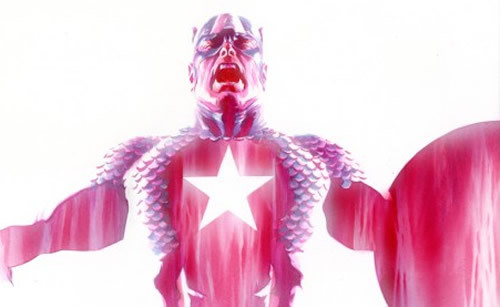 As you may also know, the Captain America movie is going to be set mainly during World War 2. 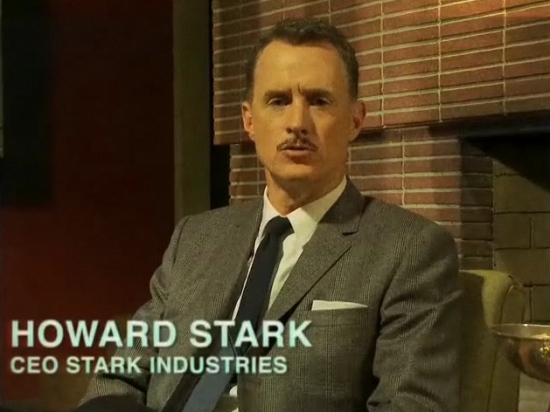 This means that Howard Stark (John Slattery) would have been in his prime back then. Plus being a mover and shaker in the technology world he would probably have been involved in some way with the Super Soldier project. Nick Fury (Samuel L Jackson) even mentions that Howard was involved in the formation of SHIELD. MTV news spoke to director Jon Favreau about the possibility of Howard Stark showing up in the Captain America movie. “Yeah, because he was around then,” confirmed Favreau. “[Howard Stark] was starting out during that time, and [he] was involved with the war effort, much like Howard Hughes,” said the filmmaker. POLL: What did you think of Iron Man 2? Just a lovely piece of art work. Finally got to see Iron Man 2 today and loved it. Lots of nods to the comic book fans and Tony’s use of what looks like Captain America’s shield is brilliant. Robery Downey Jr was born to play the role. Nice to see Sam Rockwell doing some of his Confessions of a Dangerous Mind dancing as well. As for Scarlett Johansson in the Black Widow catsuit…..Kerpow! 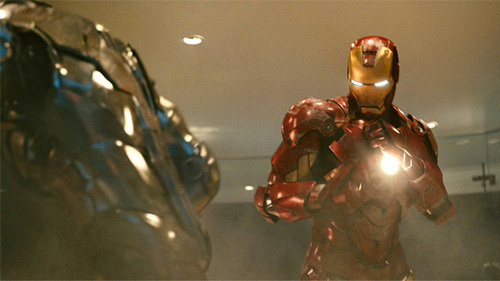 Iron Man 2 is just about to hit cinema screens (check out the LFF review) and Thor is well underway. Now Joe Johnston Captain America has a start date. Production Weekly posted the news. Marvel’s “Captain America,” have opened a production office at Shepperton Studios, principle photography is scheduled to begin June 28th. That means we should start getting photos and news of the shoot from the end of June onwards. 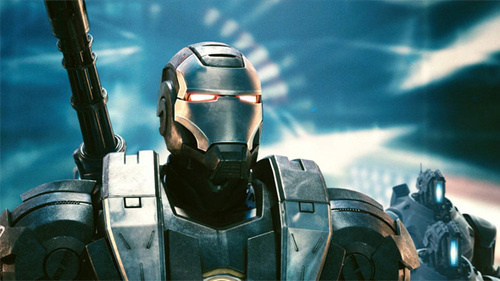 Two years ago, as the first Iron Man film was being showered in almost universal praise, there was one criticism levelled at it in review after review – that it lacked action set pieces. It’s safe to say this won’t be a sticking point for viewers of the sequel, as it is packed to the gills with fight sequences. The problem with this new action-packed take on Iron Man, however, is that much of the action feels like it’s been crow bared in. At each crash of a super-suited fist the film trips over itself, as story and characters are temporarily sidelined to satisfy Another Pointless Super Scrap. This is particularly true early on in the film, with the introduction of Whiplash. Taking place about twenty minutes in, we know too much about the character for him to feel mysterious, but not enough to particularly care about why he’s fighting Stark. This is unfortunate, because, with the exception of a couple of fairly slapstick moments, this is one of the better executed action sequences in the film (more on that later). In the midst of all of this unnecessary action, are some very strong elements. The characters are generally well rounded, even if the story itself lacks any real thrust, and as with the first film, the performances are almost universally excellent. The main exception to this is Mickey Rourke as Whiplash. With a loosely-sketched back story, and a very linear arc, he simply isn’t interesting enough to be the film’s key villain, and Rourke struggles to imbue the character with any real personality. In addition to the well rounded characters, there were several references back to small but memorable elements of the first film that pay-off some of the support players, although these references are small potatoes compared with the wealth of references to films to come, from Black Widow’s blue SHIELD catsuit to Agent Coulson being sent to deal with Thor. There is also a reference to Tony Stark’s future alcoholism, although it seems unlikely that an audience could really sit through a third ‘wayward Tony Stark makes good’-story. In spite of these positive elements, the film has some serious down sides. The plot is functional but empty, and Tony’s quest to find a hidden message from his father is logic defying. If the subject of the message were so important why is it hidden, and more to the point, why was it not mentioned in the first film? The biggest issue the film has, however, is that watching two men fight with masks on is ultimately unsatisfying. No matter how much damage we see the suit take, and how little energy/control the occupant has, it’s nearly impossible to connect with them when we can’t see their face. Iron Man solved this by having Stark and Stane remove their helmets for the final battle. The sequel ignores this technique, but fails to come up with an alternative, resulting in several dull fights, including what should have been the climactic battle. 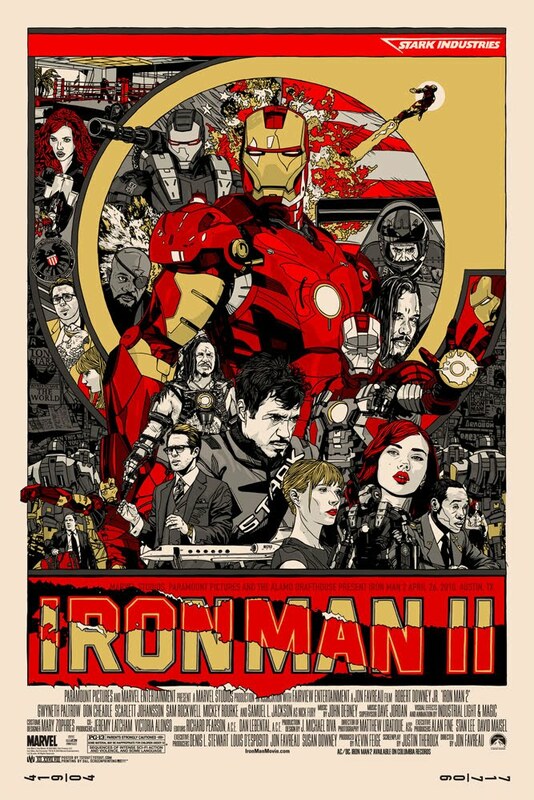 Ultimately, and despite its flaws, Iron Man 2 is still a fun and enjoyable film, filled with a great deal to like. It might not be a patch on its predecessor, but it is considerably better than many of the other films within its genre. This explosive game shows that Unity is bringing the 3D browser game to a new level of sophistication. There is also some interesting innovation in social gaming and virtual worlds has come with the release of Paramount’s Iron Man Audi Space Playstation Home takeover. Iron Man 2 – Want to know what happens after the credits of Iron Man 2? Well I haven’t posted it here, as I don’t want to spoil it for anyone. Iron Man had Nick Fury played by Samuel L Jackson talking about the Avengers Initiative. If you don’t mind finding out the ending of Iron Man 2 then follow the link for a description, clip and photo. What if… HBO created a TV show with the Marvel characters (cast as we know them) set 100 years ago? Using footage of actors such as Hugh Jackman, Tobey Maguire, Robert Downey Jr and many more from period piece movies, this video is an LXG-style mock-up of a concept I’ve had for a while. I’ve even included an opening scene for added effect. Footage from: Ghost Rider, Daredevil, Elektra, Seabiscuit Marie Antoinette, Shakespeare In Love, Iron Man, The Illusionist, The Incredible Hulk, Australia, HBO Rome and the trailers for Sherlock Holmes, X-Men Origins: Wolverine, The Sorcercer’s Apprentice. *Notes: Everytime I see a CBM actor in a turn-of-the-century; Victorian Era; Period piece movie, I think ‘wouldn’t it be cool to put them into a trailer or TV show where they’re all humble heroes back then?’ Well, this vid is designed to do just that. Being thoughtful to the background of each shot, I used another smorgasbord of resources to offer another ‘alternative vision’ to this fun genre. Hope you enjoy it as much as I did making it!